This month Unity Collaborates with Saturday's Kizomba Festival and two of the artist on their Festival Line Up Mika & Marine and DJ Valet. Just to give you a taste of what's in store! 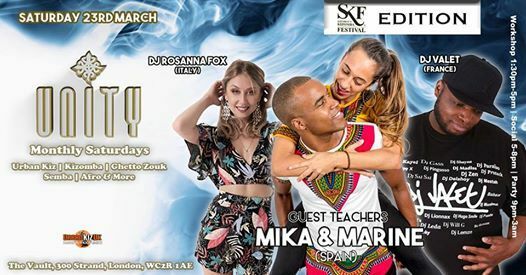 SKF #2 OFFICIAL EVENT - Saturday's Kizomba Festival 2nd Edition - The Netherlands Finest! The social (3hrs) will follow the theme of the workshop. For example when we have an Urban Kiz workshop the social will be more Urban Kiz influenced to aim practice and experimentation. Kizomba the social will be more Kizomba influenced etc. Unity is set in a 400 capacity room, fully air conditioned, located on the Strand in central London. Dancers will have the freedom, comfort and space to express themselves.